As a result of the Portland community-based collaboration funded through the EPA Urban Waters Program and led by the Oregon Operations Office, the EPA Office of Sustainable Communities provided technical assistance to the Jade District to develop community-based green infrastructure proposals. 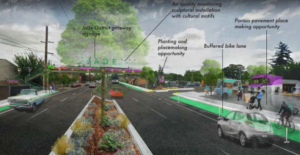 Through the EPA-led collaboration, Ecotrust partnered with the Asian Pacific American Network of Oregon to provide the economic benefits of the green infrastructure to one of Portland’s most historically underserved neighborhoods, the Jade District. This community was the focus of a charrette workshop supported by EPA’s technical assistance that designed green infrastructure solutions for a community burdened by high hazard roads, little public transportation and lots of paved surfaces. Ecotrust’s report, Greening the Jade, explores the results of the cost-benefit analysis conducted for three focus areas and offers suggestions for how to channel investments so that community members receive the benefits rather than the creeping economic and cultural pressure of gentrification.